The Museum’s collection includes more than 28,000 works that represent Western and non-Western art from ancient periods, the European Middle Ages to the nineteenth century, and American art of the twentieth and twenty-first centuries. The collection was started by John Ringling, and it continues to grow. In addition to the accessioned art collection, the Museum’s Archives and Art Library contain research collections focusing on John Ringling, the art which is contained in the Museum’s collection, institutional records, and the historic and modern circus. With over 40,000 items The Ringling's online collections provide you with access to a variety of information about our objects, including those not currently on display. Take a look! Objects which are not on display may be available for viewing in the Citrin Study Room. To arrange a visit please complete our online request form. Requests for reproduction and/or redistribution may be submitted online using the application for Right and Reproduction. Preserving the archival collection records of historical value, encouraging scholarly research and serving as an educational resource about the Museum of Art, the Ringlings and the American circus is the mission of The Ringling Archives. The Art Library collections encompass subjects such as fine and decorative art, art history, architecture, fashion, and theater. Students are welcome to browse or access the wide variety of resources available for their studies. 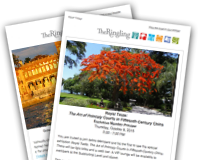 At The Ringling, this responsibility is central to our mission, extending not only to the art and artifacts of Museum of Art, but to Ca' d’Zan, the Circus Museum and the Historic Asolo Theater as well.